Day 1 has come to a close here in the bone-chilling southern region of Patagonian Chile. As some may have expected, Team Bend Racing Yoga Slackers, have earned their spot leading the wild pack of racers in this years' edition of PER. With Columbia VidaRaid and East Wind on Bend's tail, this race is truly defining its' motto, "The Worlds Last Wild Race." Checking in at PC-01 with teams Terra de Gigantes Selva, Equipe Harpya XP Investimentos, and DAR Dingle; the crux of section one is the final 300 meters to reach the saddle of Cordon Prat, a technical and mandatory gut-churning vertical pitch. Only one team was able to reach the end of this trek at PC-01 from the starting line in 24 hours and it was Bend Racing in 23 hours and 52 minutes; after crossing the saddle around 4:00 am. Broken trekking poles, frostnipped fingers, and temporary insanity are all things to be expected from the punishing mountain crossing on stage one. It speaks volumes of the calibre of all 10 teams in this edition; at the time of writing not one team has dropped out of the race. More than 36 hours after the race start, there are two teams who are close, yet currently still have not reached the scowling saddle of Cordon Prat; a place of which nightmares are made. Lead teams like Bend Racing and East Wind dug deep, in the ferocious conditions where temperatures dropped below zero and snow flew horizontally in the wind. The story has begun to unfold, between the racers and the unforgiving terrain of Patagonia, as always it allows an opportunity for racers to challenge themselves infinitely in this extreme expedition race. By 12:38 this afternoon there were four teams on the bikes ranging from PC-01 to past Puerto Natales. Catching up with Saul Abril from Columbia VidaRaid, he explained they missed their early opportunity last night to maintain a lead on Bend Racing during a crucial moment reaching the saddle of Cordon Prat. "The snow, the dark, and the low lying fog and clouds made it difficult to navigate and we ultimately made a mistake taking a left instead of a right where Bend Racing took the right, gaining the lead with proper navigation." At 13:41 we crossed paths with East Wind on the road just outside of Puerto Natales. As I watched them approach through the zoom lens I almost mistook them for Spartans as they were in a peloton formation to protect team captain, Masato, from the wind. East Wind is notorious for their poise and strategy which has proven to pay off over the gruelling long days and sleepless nights of PER in the past. SleepMonsters caught up with DAR Dingle at 18:13 as they were transitioning at PC-01. This is a team racing with three women and one man; a PER first. The women joked that the lone man, Noel O'Leary, had been "a proper house husband", bringing them tea and breakfast in bed. 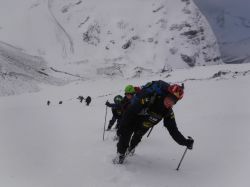 The team had taken the wise decision to camp and get some sleep before attempting to cross the two mountain passes in this section; Cordon Chacabuco and Cordon Prat. This decision meant that they missed the worst of the bad storm that raged through the night and allowed them to see the spectacular views as they crossed during the day. Noel O'Leary casually asked me if I had any images from the mountain section and proceeded to hand me his small pocket camera. I quickly downloaded the images on my laptop as they finished their preparations. Looking through the files after they'd left, my jaw dropped. The photos spoke more eloquently than any words could of the extreme conditions on the section. The photos can be viewed on SleepMonster's FB page. The field continues to spread out on this second night of racing with back teams approaching Cordon Prat on the first section while lead teams have already finished the cycle ride on stage and have engaged in yet another massive trekking section, this time through the infamous Patagonian "turba" [peat].